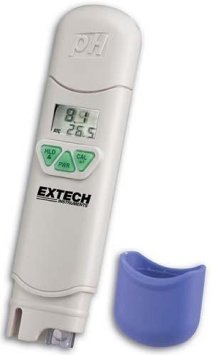 The Extech PH60 Waterproof pH Meter With Temperature has a pH range of 0 to 14pH and a temperature range of 32 to 122°F (0 to 50°C). It has a dual LCD screen that displays both pH and temperature readings. This meter has automatic temperature compensation, low battery indication and auto power off. It is easy to calibrate a single CAL key with the automatic pH buffer recognition (4, 7, and 10pH). The user has a choice of 3 point calibration for better accuracy. Also, this meter has a data hold feature that freezes the readings on the display. 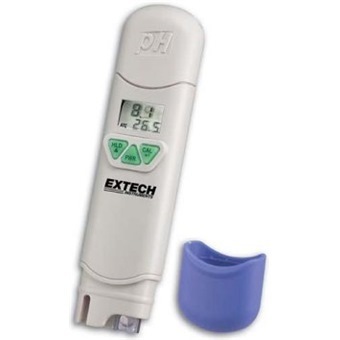 The Extech PH60 Waterproof pH Meter comes complete with the built in electrode, a sensor cap, an inner pH electrode protection cap, and four LR44 button batteries.